About one half of Kananaskis contains 5 provincial parks, 4 wildland parks and 47 recreational areas all in Kananaskis. Then the other half is public lands with no protection. All of that – all the parks and public lands – is in an area that is two-thirds the size of Banff National Park. 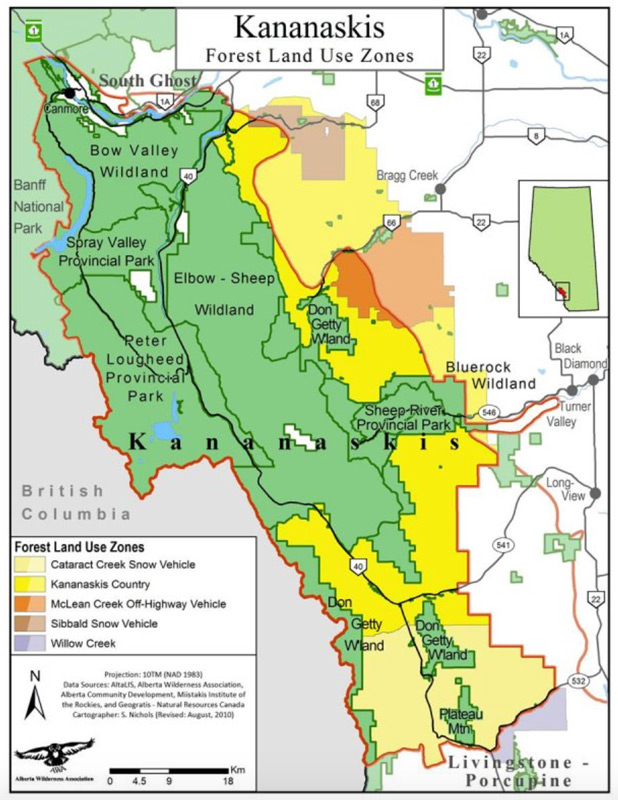 Within the Kananaskis Improvement District, all land is classified as one of six land uses. Regions under direct control by the Kananaskis Improvement District. The purposes of the parks are clear, and their development is guided by the provincial government. These are the regions that most Albertans are familiar with. Ecological reserves are protected areas where the wildlife, plants or landscapes that are considered valuable. The intents of these areas are also pretty clear. A few sections are under the direct control of Kananaskis Improvement District. These lands include Kananaskis Village, the golf course, Nakiska ski area, lodges, research centres and for utilities. Most buildings outside of parks and recreational areas sit on land that is under the control of the Kananaskis Improvement District. Public lands is the category that has the broadest definition. The rest of the land in Kananaskis that isn’t a park, wildlife reserve, recreational area or under the direct control of the Kananaskis Improvement District is public land. Priorities for these regions are equally broad – the land use is determined by the Public Lands Act, the Forestry Act and recreation policies and resource plans. Public lands make up a major part of Kananaskis. Nearly the entire eastern and southern borders of Kananaskis are public lands – meaning they are not explicitly protected as parks for wilderness or recreation. That’s where logging can happen. I had no idea that Kananaskis was under threat, but this makes it very real. I think, right now, it is our responsibility to maintain the wilderness we have left. Our wilderness is a rare luxury in this world, and its benefits, now and in the future, far out pace and influence more than the financial value of the commodities derived from it. I grew up hiking in the Kananaskis, and it would break my heart to see it turned into a clear cut and a dead zone for wildlife, like so many BC forests. I hope this story ends happily for me and so many like me.